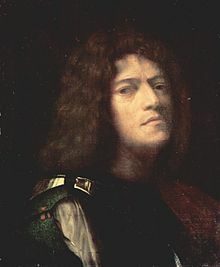 Giorgione (Italian: [dʒorˈdʒoːne]; born Giorgio Barbarelli da Castelfranco; c. 1477/8–1510) wis an Italian penter o the Venetian schuil in the Heich Renaissance frae Venice, whase career wis cut off bi his daith at a little wer 30. ↑ "Giorgione (Italian painter)". Britannica.com. Retrieved 2013-05-27. ↑ Gould, 102–3. Vasari's 1st edeetion haed the umwhile, his 2nt the latter. Thare is no documentary evidence, an Vasari gets his date o daith, which is kent, wrong bi a year. This page wis last eeditit on 6 Mey 2016, at 14:21.